For every steamy Tinder fling, most singletons have a catalogue of at least five stories of online dating woes. But what really grinds your gears about the world of virtual lurve? The terrible spelling and grammar? Or the agony of swiping through profiles WITH YOUR FINGERS? Well, a new dating app aims to eradicate this last struggle once and for all. American tech agency T3 has created a version of Tinder for the Apple Watch which removes the need to swipe through potential beaus altogether. 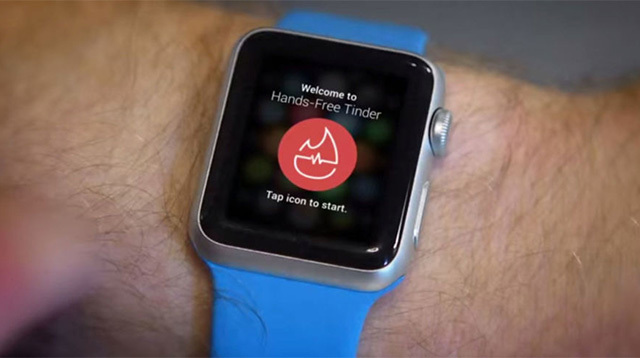 Hands-Free Tinder uses your heart rate to decide for you whether you fancy someone or not, by making use of using the Apple watch's ability to measure your pulse. Heart-rate up = like, heart-rate down = nah. Then if you "like" each other, it's a match. Simple. But we're not totally sold. While an attractive Tinder photo may get your heart pounding, so can a LOT of other things. Fear, for example. And, let's face it, some Tinder guys can be pretty terrifying.